These archived Bally Arcade/Astrocade programs are for use with Bally BASIC (the BASIC that requires an external tape-interface to load and save programs). ARCADIAN 1, no. 6 (May. 4, 1979): 44. From the Arcadian: "Random Art is a quick little moving box program." 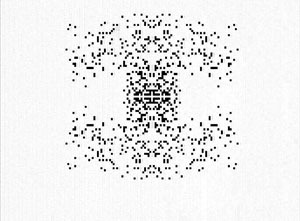 Random Art creates a single-color, random art pattern based upon width and height increments which are input by the user. ARCADIAN 2, no. 2 (Dec. 22, 1979): 17. The "Arcadian" has no instructions or comments for this short program. This program simply draws random sized boxes on the screen. ARCADIAN 7, no. 3 (Mar. 21, 1986): 47. 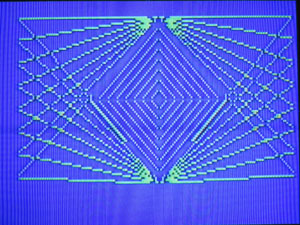 This video art program will run in Bally BASIC, AstroBASIC and Extended BASIC (Blue Ram BASIC or Vipersoft BASIC). There were no instructions in the Arcadian, but the original program submission letter (dated August 9, 1985) included three programs on one tape. The comments about RND Pixel Design are, "The third [program] is a short RND pixel program." ARCADIAN 1 no. 11 (October 31, 1979): 85,90-91. This program renumbers a BASIC program by using a tape as output, meaning the program in memory isn't actually changed, only the program on the tape is changed. By Reverse Brett Bilbrey and Mike Toth. From the Arcadian: ""Reverse" is a One Player Game that uses one Hand Controller. The object is to get 9 number in order (smallest at the left) that are initially in random order. Use the knob to identify the numbers to be moved, and the trigger to move them." RM = Remainder "RM = Remainder"
By Tom Wood and Bob Fabris. ARCADIAN 1, no. 3 (Jan. 13, 1979): 18. "From the Arcadian:" RM = REMAINDER" is interesting. Normally the TBASIC swallows the remainder of a division and only tells you of the whole number part of the answer. But with the knowledge of RM, we can convert it to a decimal and print it"
By Super Software (Rob Rosenhouse). ARCADIAN 4, no. 2 (Dec. 07, 1981): 17. 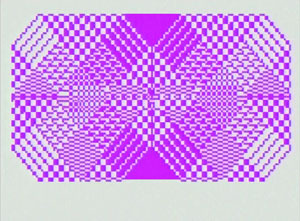 This video art program was submitted on a tape to Bob Fabris around November 1981. In addition to RANDOM ART, the same tape also contained FALLING STARS and LASER BATTLE. The latter two programs were NOT meant to be printed in the ARCADIAN newsletter. Bob Rosenhouse requested printouts of the latter two programs from Bob Fabris. ARCADIAN 2 no. 1 (November 29, 1979): 1-2. ARCADIAN 2 no. 5 (March 24, 1980): 39. Two saucers fire at each other until the max score is reached or one saucer is depleted of charge. By Brett Bilbrey and Joe Borello. From the Arcadian: "One Player, Hand Controller. 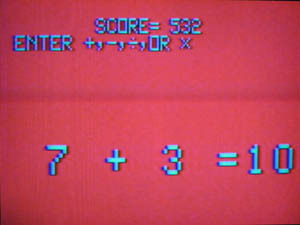 The computer shows you a pattern that you have to repeat, using joystick controls. ARCADIAN 2 no. 3 (Jan. 15, 1980): 21. Arcadian 4, no. 8 (Jun. 11, 1982): 79. This program has no instructions in the Arcadian, nor does the Bob Fabris Collection have any additional information about this game. The game features a well-drawn, animated slot machine. The player places bets (from $1-$5) using hand controller #1. "Pull back" on the controller (press down) to pull the lever and "spin" the reels. 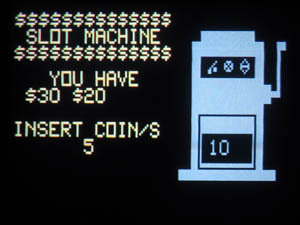 An early time-period slot machine game for BASIC. There may be more of these types of games for Bally and AstroBASIC than any other game genre. ARCADIAN, 1, no. 8 (July 1979): 65. "Sound Graph" is part of the "The Music Synthesizer" tutorial by Chuck Thomka. In order to understand what "Sound Graph" is doing, the user must read the tutorial or at least have previous knowledge of the sound ports. With this knowledge, then you may be able to make some noises, but you won't be able to understand why they work or really what is happening. The object is to destroy the nasty Klingons again. They must be friends of the Empire, because they too have a Death Star, located in one of the quadrants. Shooting it with a torpedo will get you recharged and reloaded with torpedoes. Moves you into one of the nine (3x3) quadrants, first enter x-value (1 to 3) then y-value (1 to 3). ARCADIAN 1 no. 10 (Sept. 31, 1979): 79. This program was typed in using the Windows PC utility "txt2prg." Paul Thacker says, "It's a neat idea for a two player game. Each player has a ship on one side of the screen, and can move up and down and fire at any angle. However, the ships are invisible, so you can only figure out where your opponent is when they fire a shot." ARCADIAN 3 no. (July 9, 1981): 91-93. Directions from the "Arcadian:" "Spinning Wheel" is a combination program that Tom Owczarek uses at Faires as a fund raiser. The first part takes the place of the old 'round and around she goes' wheel of fortune with an RND(30) plus exploding box display while the computer is deciding which of the 30 numbers is the chosen one. Then there are three designs and dummy advertising messages which you would want to change for your own usage. Use GO to restart the game, and always wait for "Place Your Bets" before making any entries. ARCADIAN 2, no. 8 (Jun. 23, 1980): 69. The Arcadian has no instructions or comments for this program. Paul Thacker comments on June 26, 2013: "Various patterns spiral out from the center of the screen, moving clockwise. The patterns have a rectangular shape. The background color is white, and the foreground color is black." ARCADIAN 2, no. 10 (Sep. 17, 1980): 95. Paul Thacker comments on June 26, 2013: "Various patterns spiral out from the center of the screen, moving clockwise. The patterns have a rectangular shape. The background color is white, and the foreground color is black. The patterns are rotated like a diamond." ARCADIAN 3, no. 1 (Nov. 06, 1980): 6. The Arcadian's directions for this game are very short, "This math drill program uses the giant letter routine." "On side one there is a short program that uses the "giant letter" routine. This is a math drill program that I call SPEEDO-MATH. All input is through the keypad. If your subscribers modify this very much, the letters will have to be moved higher on the screen to avoid wiping out the program." Letter to Bob Fabris from Bob Wiseman - Text transcription of Bob Wiseman's original program submission letter for Speedo-Math. ARCADIAN 1, no. 8 (Jul. 20, 1979): 67. The Arcadian does not have any comments or instructions for this program. Although the name implies that the program calculates a square root in BASIC, it would be impossible to know that while running the program as it gives no indication of what the program is asking for at the INPUT prompt. Only a look through the code would give a hint of that information. ARCADIAN 4, no. 2 (Dec. 07, 1981): 19-21. Archived from tape in Richard Houser's collection (not a compilation tape). Starfighter sets up the screen up as a viewport to space, where an even dozen alien ships are waiting for you. You will see a set of crosshairs, and then an alien ship will appear. Move the joystick in the direction of the ship to line up the ship in the sight. Pull the trigger to fire. You can only get a hit if the ship is in the dead center (not easy at all). You are in trouble if your shields get to 0%, or the temperature goes up to 100. ARCADIAN 4 no. 7 (May 7, 1982): 72-73. $100 prize winner in Arcadian (May 1982). This program is for use with Bally BASIC only; it is not compatible with AstroBASIC. Richard Degler took the time to figure-out the differences between the two versions of "Stranded on Rigel 5" that have been archived. He notes that each program is essentially the same. What is REALLY appealing is how much effort he took to understand what the machine language portion of the program is doing. By Bob Wiseman, modified by Klaus Doerge. This is a modified version of Bob Wiseman's original program. This modification was NOT published in the Arcadian. ARCADIAN 3, no. 11 (Sep. 11, 1981): 113. Archived from tape in the Bob Fabris Collection. From Robert's June 11, 1981 program submission letter to Bob Fabris, "Enclosed you will find a tape with another "Random Art" program enclosed on it. I would appreciate it if you would print this program in the soonest possible issue." Arcadian 3 no. 11 (September 11, 1981): 114-115. This is an educational game to help children learn to tell time. The computer will randomly set the clock and ask "THE TIME IS." The hours and the minutes can be entered by using JX(1) and JY(1). Pull TR(1) when you completed the answer. If the answer is right a bird will fly from the clock to the bell and ring it. If you are wrong, the bird will appear and chirp "Coo Coo!" The computer will then ask you to set the time to a random time. You can move the hands by using JX(1) and JY(1). Touch Tone Simulate "Touch Tone Simulate"
"Touch Tone Simulate" allows the user to type in a phone number, and then dial it by placing a phone near the TV speaker and then pressing PRINT. The Bally Arcade will automatically dial the phone number. Make sure that when you use the program that your TV's volume is set to a high enough level so that your telephone can "hear" the TV. ARCADIAN 3, no. 7 (May 08, 1981): 79. The following program was sent by Bill Loos, which, along with the list of variables, will provide some unusual sound effects. Make direct substitutions of the values of X and Y as recommended, either individually, or by grouping two or more together. ARCADIAN 2, no. 3 (Jan. 15, 1980): 19. Paul Thacker comments on June 26, 2013: "These programs both crash in an inconsistent manner. I observed various behavior like the screen flashing various colors, white or colored pixels randomly appearing on the screen, and the machine playing a continuous tone. After awhile, the programs will freeze, and the machine must be reset to recover." ARCADIAN 2, no. 5 (Mar. 24, 1980): 39. Lettering in different formats is always of interest, as we can liven up programs with unique presentations. 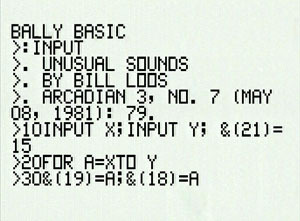 The following program ["Arcadian Sampler"] provides you with two versions of lower case, from Anderson Research. While this one [Weird!"] from Tim hays adds some sound effects. He wonders if you can figure out what it does by just looking at it. You can get letters 5x normal size. One to four players. On your turn, use the JY to position the arrow to the dice you want re-rolled. Then push JX to erase the dice (once gone they're done for good). After you have 'turned off' the dice you want rolled, pull the trigger. After three rolls, you will be shown the scores. Use JY to position the arrow to the one you want, and then pull the trigger. Scores almost like real Yahtzee. SAVEing this way will allow lines 5 and 6 to be recorded for credit purposes but will automatically delete them from memory each time the game is loaded. The :RETURN command resets NT to 3. The FOR/NEXT loop puts a short leader on the tape. Setting NT to 2 while recording and to 0 while loading helps prevent lost bits on reloads. ARCADIAN, 2, no. 3 (January 15, 1980): 23. This is from the BRIEF in-game instructions: "This game does not keep time. The joystick steers the target, the trigger fires the laser. No hit is scored unless the screen reads 'LOCKED'."